Only Raf Simons can have a show a 40 minute drive outside of Paris and know that everyone (and their mates) will show up. Last night the designer returned to the French city after a few seasons showing in NYC. Here’s what went down. Although TBH it was probably just a rural warehouse which production magicians Bureau Betak turned into a techno club. After wheatpasted posters of punk doppelgängers of Robert Mapplethorpe and Patti Smith greeted the audience at the doors, the packed, red-lit space featured a snaking black raised runway, as well as a troupe mannequins hanging from the ceiling, and a series of black and white poster prints. 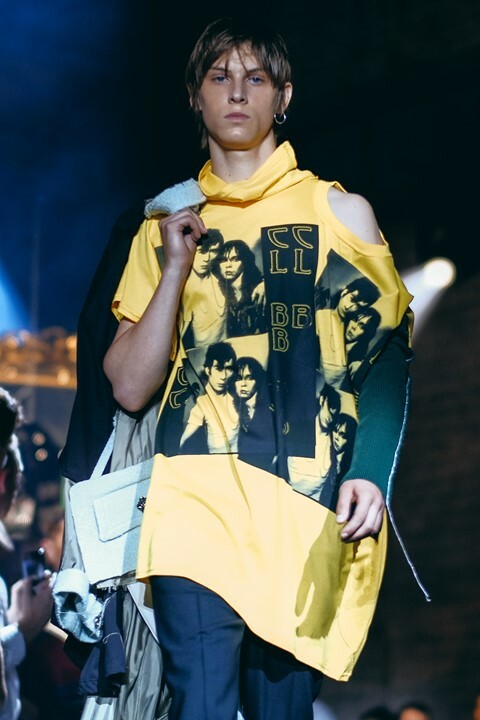 A$AP Rocky, Kim Jones, Naomi Campbell, and Jonathan Anderson (in one of his David Wojnarowicz tees for Loewe) were all in the crowd, but with no seating they had to jostle for space with everyone else. After last season’s narcotic-themed collection and campaign, this time Raf moved on to another vice… drinking. Models carried silver cans cradled in fabric which looked like the plastic which holds beer cans together (and which was also turned into tops – a flashback, Raf said, to an archive design). It didn’t end there – there were earrings which looked like ring-pulls and ring details embroidered onto tops. “It was the idea of the six-pack and eight-pack and how kids hang out and they grab their beers,” the designer said. 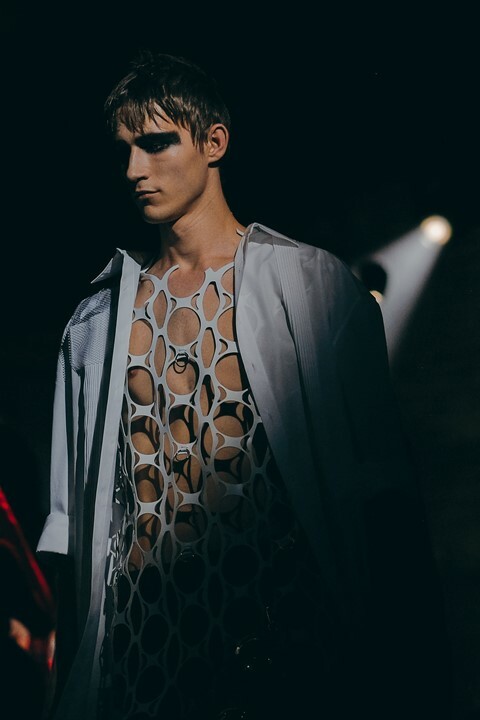 ...jointly hosted with Undercover, which showed before Raf (and also used the same Bauhaus tune to accompany one of the gangs that hit its runway – great minds?). Held in a similarly red-lit club not far from the venue, DJs Clara 3000 and Nina Kraviz put an end to the night which reminded everyone just why we’d missed Raf Simons so much over here in Europe.